Listing the Boat: Sail California works up a listing agreement with the seller. Typically, Sail California and the seller work together to establish the listing price, determined by an in-depth market analysis of similar boats that have sold and are for sale in the market. 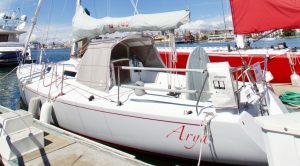 Once the boat is prepared for showing, an extensive inventory and equipment list is created along with photos of the boat. Then, the information is posted on our website for viewing. The boat’s data is also sent out to our affiliates for viewing. Additionally, we create an advertising program with ads for local, regional, and national media. Showing the Boat: The broker shows the boat to qualified customers who are interested in the boat. The Offer: A potential buyer makes an offer on the boat, accompanied by a deposit of 10%. Sail California then presents the offer to the seller and deposits the check in a trust account. Negotiations: Sail California leads negotiations between the two parties. This includes the price and contingencies of the purchase, managing the survey by the buyer, the sea trial, and subsequent negotiations based upon those findings. SOLD! After the contingencies are met, then the buyer purchases the boat by transferring the balance to Sail California. Sail California then draws up final statements and disburses the funds to the seller. Hooray! The boat is SOLD!